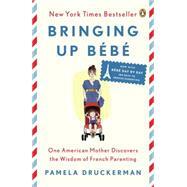 T he runaway New York Timesbestseller that shows American parents the secrets behind France's amazingly well-behaved children When American journalist Pamela Druckerman had a baby in Paris, she didn't aspire to become a "French parent." But she noticed that French children slept through the night by two or three months old. They ate braised leeks. They played by themselves while their parents sipped coffee. And yet French kids were still boisterous, curious, and creative. Why? How? With a notebook stashed in her diaper bag, Druckerman set out to investigate-and wound up sparking a national debate on parenting. Researched over three years and written in her warm, funny voice, Bringing Up Bébéis deeply wise, charmingly told, and destined to become a classic resource for American parents. Pamela Druckerman is a former staff reporter for the Wall Street Journal and has written for the New York Times, the Washington Post, and Marie Claire. She lives in Paris with her husband and three children.